This is a common question for Kiwis. Should I look for a standard user plan or a low user plan? Well, unfortunately you won’t know for sure until you have been in your property a while and know how much energy your house and its occupants consume. So… you need to make an educated guess. We will try and help you decide if you are a standard or low user with the following information which will hopefully help you make an informed decision... it is SUPER important as if you’re on the wrong plan (low user not standard user and vice versa) you could be paying too much, and we’re talking up to 100% too much, for your power. So what is the difference and what do I need? Well first off let’s look at how your power bill is made up. In NZ, your power bill has two main elements, these are a fixed daily charge and a cost for each unit of electricity used at the property. For Low Users in New Zealand there is a law that limits the maximum charge for the fixed daily proportion. This charge is 30 cents + GST per day, which works out to $126 per year including GST. For households that are on standard user plans, the fixed daily charge is usually sitting between $1.50 and $2.50 per day. This has developed as a result of the low user legislation, the truth is that to get electrical power to your house it will cost more than $126 per and so those people on a low user plan will need to subsidise that cost with a much higher per unit charge. This is the best way for the power companies to beat the legal limitation that they have to abide to. So what is the changeover point? The benchmark point is 8000 kWh (units) per year in energy consumption. This is ‘the average household’ and it was a figure that was established back in 2004. 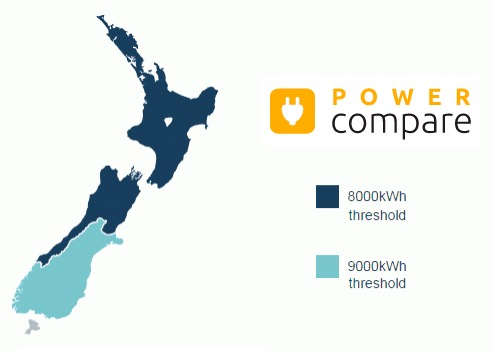 The figure increases to 9000 kWh if you are in the lower mainland (Bottom half of the South Island) and Stewart Island. What is the threshold for a Low User Power Plan in my area? As stated above, this varies across NZ but we’ve got a super handy visual representation in the below map. In the dark blue parts of the map, if you are using less than 8000 kW/h units a year then you should be on a Low User Poower plan. If you live in the light blue parts of the map then you should be a Low User if you use less than 9000 kW/h units. So, are you a low user? In general, you will be best suited to a Low User plan if your household has one or two people living in a well-insulated, energy-efficient home, often with gas for heating and hot water. Very roughly, a low user household will spend much less than $200 monthly averaged across the year – although the exact level will vary in different parts of the country. If you are spending more than $200 per month than a standard rate plan will be more suitable foir your needs. This means larger households, where people are home a lot, and electricity is used for hot water and heating. The Standard User plan has a higher daily charge, but a lower charge per kWh used, so it's ideal if your electricity usage is relatively high. You guys are the people that the energy companies are going to make the most cash out of and so the rates and incentives here are generally higher for someone to move to a Standard user plan than to move to a low user plan. Some Power companies in NZ will regularly review the pricing and power plan that you are on… others won’t, so make sure you keep an eye on your usage levels and regularly ‘audit’ your bills. Companies like Powershop and energyclubnz will ensure that they put you on the best option for your situation either or on your energy anniversary. We’ll also let you know every year on your Powershop anniversary how much power you’ve used and what the best rate option is for you.